It is a PDF. Of a study on parenthood, and how mothers of two or more children are superpeople, after a power up of two years (it takes time to develop superpowers--coincidentally about the same amount of time it takes to get any decent sleep after a new baby!). 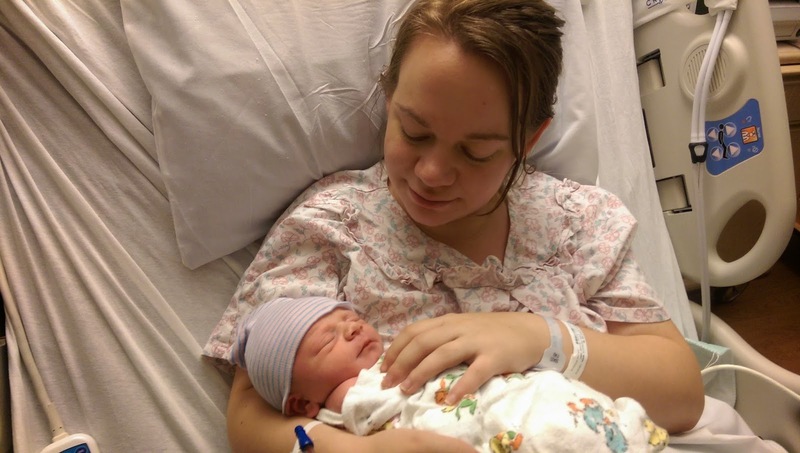 A little over two years ago, I had my third child. He is funny and stubborn and good at tackling his two older brothers at their knees. I also sort of dropped off the face of the internet when it comes to social media and querying after he happened. He is much like a natural adorable disaster in that way (and also in the way that he knocks his brothers to the floor). I've been writing. I have to write, because I love it. But let's be honest: I am not one of those rare beasts who like querying. And so I stopped the agent searching stuff. But now I need to start again! Because the study says I have superpowers, and because I love love love the book I'm working on now, and because I love reading even more than writing. It's awesome knowing other authors and after they're published telling people "buy that book, because that author is super nice and also I critiqued it and it's the amazingest!" So yes. I need to start doing business-agent-online stuff again. Our six-year-old loves making up knock knock jokes. It is a good way to delay bedtime, and also surprisingly easy when you don't need a punchline that makes sense (a recent example he made up: knock knock. who's there? pill. pill who? pillow! followed by maniacal giggling). It's gotten so bad that our four-year-old wants in on the action (knock knock. who's there? lightning mcqueen. lightning mcqueen who? followed by maniacal giggling). And our almost-two-year-old (na na. who's there? maniacal giggling). 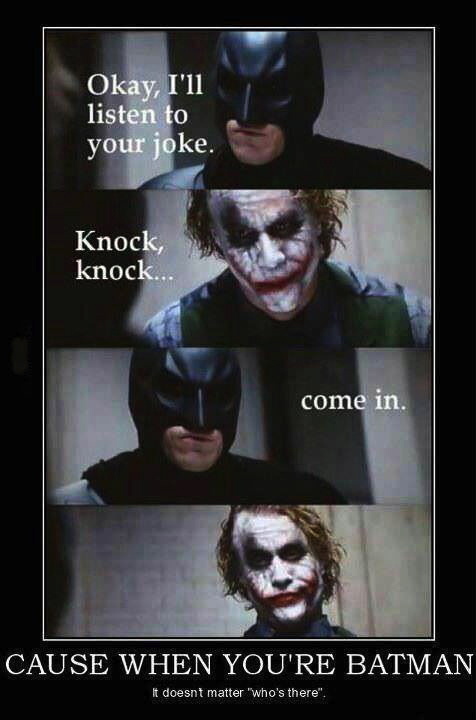 So I guess what I'm saying is that I'm in constant need of knock knock jokes. And also little kids are funny. What's the funniest book you've ever read? I love Terry Pratchett. Love, love, love. His Tiffany Aching novels, and Good Omens (with Neil Gaiman), and Discworld (particularly the Night Watch books)...all his books are brilliant and hilarious and wonderful, and I love them. I also love Fred and George Weasley in Harry Potter (hee hee...Gred and Forge). Oh! And Simkin in Margaret Weis and Tracey Hickman's Darksword trilogy (egad!). And Roald Dahl's biting, wicked pokes at foibles, and brilliant comics like Calvin and Hobbes, and (even, terribly) those lame joke books I'd buy from my Scholastic book fairs way back in elementary school. Books that make me laugh are my favorite, even when (maybe especially when) they have darker moments as well. So I'm compiling a list, and anyone who contributes gets virtual cupcakes with victory rainbow sprinkles! What, I ask you, is the funniest book you've ever read? This is not a cupcake. This is Tiffany Aching with some Wee Free Men on her shoulders and a hat made of sky. She may look serious, but trust me: if she were reading her own book, she'd be smiling. Okay. Today was a crazy I-had-to-call-911-for-the-first-time-but-hooray-everyone's-safe! kind of day, but may I say that I'm loving fall? Or that reading Harry Potter to my six-year-old makes it more magical than ever before? 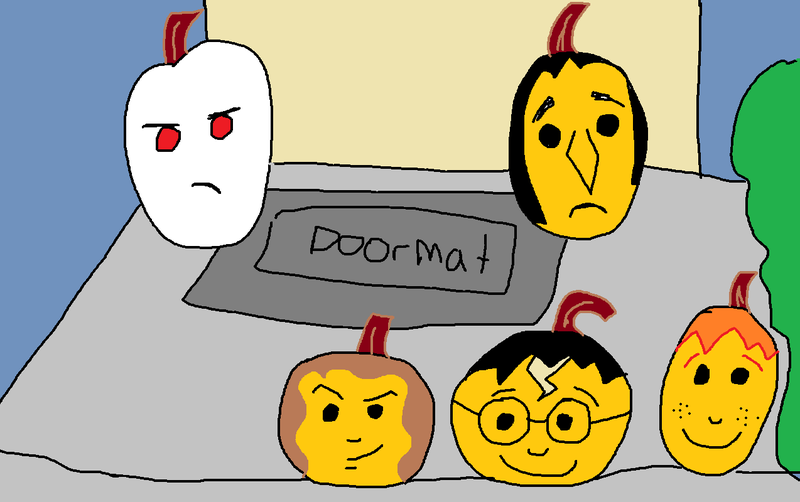 Or that, while I'm too lazy to upload my photos of the pumpkins outside our house right now, for some reason I'm willing to draw them on Paint? I swear I'll post a real picture later. Maybe. Walk in the woods answer, and also CUTE BABY! 3. Your shiny object shows what you think about love. 4. Your house in the woods lets you know how materialistic you are, and your approach to it shows your basic trust of people. 5. Your bear represents challenges in life, and how you handle it (denial, tackling it head-on, losing to it) may indicate how you deal with problems. My results were pretty accurate, actually, and at the very least I think it's a fun exercise to do once. But that brings me to something more awesome that I want to write about: me and my husband drove to Seattle with our three young sons. We went on a ferry. We visited the zoo and the beach. And, most important of all, we were there when my younger sister had her very first baby! None of my sister had kids before this. And I have to say: having a nephew on my side makes me happy. Plus, cute! Just look! 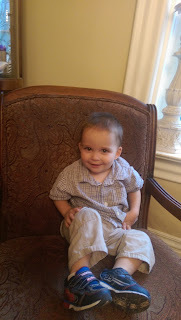 I am totally biased, but I think he's adorable. Look at that face! 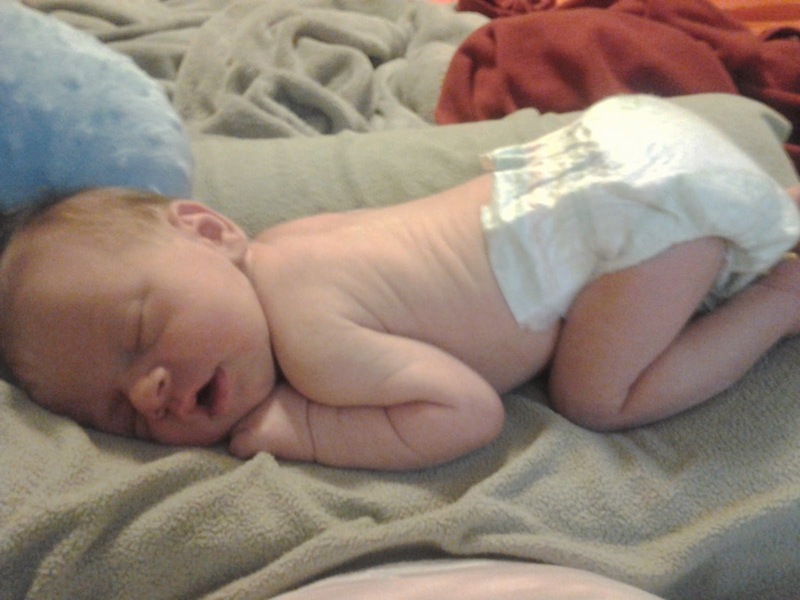 That little diapered bum! I like teaching: it's creative, it feels important, and I'm never, ever bored. I don't talk about teaching university writing much here, but I love my job. Here's a quick activity we did the other week in our class if you want to try it...I claim it shows how sometimes writing can reveal things we didn't realize consciously, although I really do it just because it's fun. And it worked for me when I did it in a class. Let me know if it works for you if you try it! So. You start out by pretending you're walking on a path. You walk and walk, and soon enough you see that your path goes into the forest. What is the first image for the forest that comes to mind? How do you feel about the forest? (This is the first question I ask my students, and I have them write a brief description of their answer). If you survive, go back past the house, shiny object (if it's still there), lake, and out of the woods in your mind. Hooray! Done! Leave your answers in the comments if you dare! (Question 2 is potentially the most embarrassing, so you can skip that one--but it's not THAT bad:). I'll go over the answers in the next couple days. Mmm...I love forests. I could go for a walk like this right now. Quick note. I'm alive. The ear infection turned into two ear infections, strep throat, and double pink eye. It passed from three-year-old to six-year-old to one-year-old to me. I graded hundreds of essays. I revised and made my book so shiny that it made me cry at the sad parts, and survived the everyone-throws-up-but-me party the week after everyone recovered from strep. And this picture, because cute! 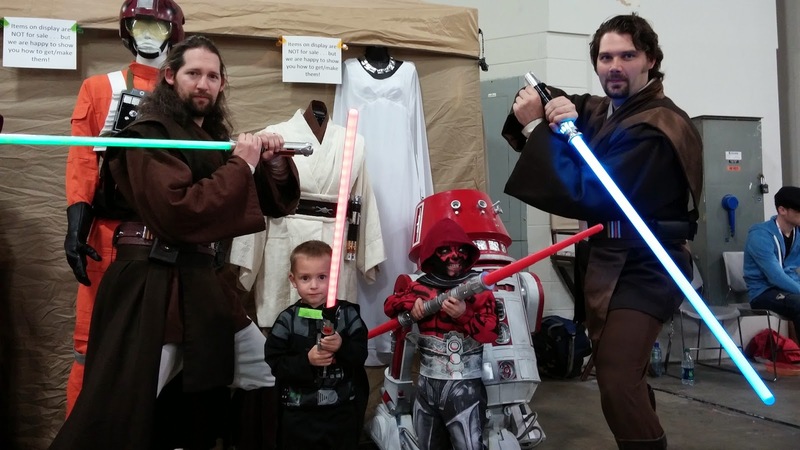 Yes, the small Sith Lords are mine. It was adorable on the Dark Side that day. Brenda's a mother to three cute boys, a teacher of university writing, and an author of middle grade and young adult fiction. She supports making cakes, making games, making bubbles, making books...pretty much any kind of making is brave and awesome!